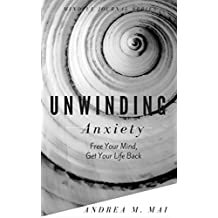 Last January I published “Unwinding Anxiety: Free Your Mind, Get Your Life Back” which was based on the practices and tools I used to dismantle years of chronic anxiety that was beyond worry, concern, stress or feeling awkward. It was full-blown panic attacks in the middle of the night, a ripped-up stomach and pain in my chest constantly. It was depression over how my body and mind had spiraled out of control. So… there was that. I wrote and published it after I’d stopped suffering anxiety for more than a year. At that point I felt it was okay and meaningful, considering I hadn’t gone a day without crippling anxiety for at least 5 years. And now, here we are today. Time for an update! The reality is I don’t suffer anxiety attacks anymore because I interrupted my patterns and collected a strong set of tools. Sure, I experience moments of overwhelm or stress — I have a lot of projects in the air and on the ground – but the anxiety isn’t there. Sometimes I see it in my rearview mirror or catch a glimpse of it on the periphery as it tries to sneak up on me. My body or my mind will get a little tight. When that happens I touch into the moment using deep centering breaths and come back into the moment, into the ‘now’ because my experience taught me over and over that anxiety was usually connected to an imagined scenario in the future (things that never came to pass). TRY THIS: Take a moment right now to close your eyes and breathe deeply for a minute. Allow your mind to be like the wide open sky, blue the way it is above the clouds. Repeat this often throughout the day. Having been a meditation practitioner for many years, I didn’t see why I couldn’t get out of it. And then I decided to do something new. I applied all of the practices right in the center of my panic attacks. I breathed with focus. I held space for myself. I sent compassion to me and those who suffered like me. I activated each practice as I was drowning, barely able to breathe. The practices were great on their own for allowing me to get to know my mind and see the habitual patterns but when I used them right in the middle of the anxiety attack –when I applied meditation, breathing, and compassion to the pain in my body and mind — things started to shift. A little respite would rise up from the darkness; a glimpse through a dirty window like someone had rubbed off the dirt with their shirtsleeve. That someone was me. I worked to nourish my body with good food, get as much rest as I could, use the tools and keep them sharp. And you can do this, too. What about now? It’s been a year since “Unwinding Anxiety” was published and things are good, better than they’ve been as far back as I can remember. I see clearly and know when things are trying to start up again because I can see it from a mile away. Sometimes I get forgetful and don’t take as good of care of myself as I should. That’s when I see the dust cloud way off in the distance. Now, I have the tools to change my path. After unwinding it all the way, the key things I rely on regularly are mindful-awareness around how I’m treating my body – eat good food, get enough sleep and relaxation, and get fresh air daily even if only for a few minutes of focus. I use my breath and a few bits of yoga for both body and mental health. But the thing is – all of these are small efforts – maintenance mode versus heavy training. I don’t do these just to prevent anxiety. They are the foundation for a really groovy and happy life awake to the potential of each moment. Not a bad way to live life, if you ask me. If you or someone you know experiences anxiety, I encourage you to pick up a copy today. It’s short and set up as an experience– put the stuff to work as you read through the pages.